Pedestrian gates essentially allow residents to enter a location or property through a narrow entry way, and they can have both functional and aesthetic purposes. Motorisation can also be added to these types of gates meaning you can also take advantage of your entry gate’s convenience and accessibility. No more fumbling around for keys or having to juggle things if you’ve got an armload of groceries! Here are five reasons you might consider installing a pedestrian gate in your home. 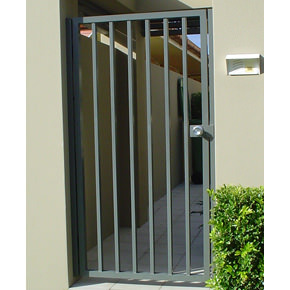 When designed and installed properly, entry gates including a pedestrian gate are the ideal way to deter thieves. They can not only help reduce unauthorized foot traffic to your property but also keep your home safe and secure, particularly at night. If you’re also a relatively private person and don’t like to be bothered by unwanted guests (including those selling services and/or spruiking their products), then a pedestrian gate can also help maintain your privacy. They can also allow you to partition areas off in order to create defined spaces, which will not only add to the aesthetics of your property’s entrance but up the privacy factor. Nothing is more important than guaranteeing the security of those you love. And when it comes to young children, it’s making sure that you are providing a safe and protected environment for them to live and play in. A security fence as well as a pedestrian gate will ensure they are kept out of harm’s way, and help ease some of the stress that comes with dealing with adventurous little ones! Pets, particularly young animals, are also prone to wandering and there is also the danger of them being stolen. Perimeter fencing that includes a pedestrian gate will ensure they are kept under your watchful eye and away from busy thoroughfares and potentially fatal traffic. There are a huge range of both security and pedestrian gates on the market, which means choosing one that complements your home’s exterior is an even easier undertaking. Both driveway gates and pedestrian gates can also perform a practical function, in that they can be used to discreetly hide equipment and utility areas like water tanks, sheds, bin spaces and mechanical equipment. A good quality pedestrian gate will increase the curb appeal of your home, ensure a stylish design focus for your property’s entrance way and create a positive impression. When the time comes to sell, it can even add price potential as buyers will appreciate the security it offers. The more secure your home is, the less likely it will be that someone will attempt to break in. Less risk means less insurance claims due to theft, which means more money will stay with your home insurance provider. And that will certainly make them happy! Most Australian insurance companies will reward homeowners who take home security seriously. This includes having security fencing including a pedestrian gate to deter would-be criminals. Others will further reduce your premiums if you upgrade your security to include things like CCTV surveillance equipment, the cost of which will be offset over time. It’s certainly worth asking the question, and if they aren’t willing to assist in this area, shop around for an insurer that will! A pedestrian gate will not only also increase the security and accessibility of your home if you choose aluminium fencing you’re also choosing a product that’s extremely corrosion resistant, light-weight and less expensive than other products like steel. Modern aluminium fencing also comes in a variety of styles and colours meaning it’s easy to find fencing that will complement your home and the surrounding landscape. Here at FenceCorp, our aluminium pedestrian gates are available in a variety of styles, that are single swinging which means they are cost-effective and easy to install. Compared to sliding gates, other advantages of swing gates are that they can be opened internally or externally, they have a quiet and smooth operation, and no steel beams or concrete work is required in order to install them. Our range also includes gate frames, which are used for attaching traditional vertical or horizontal timber slats to a gate. This is a great solution if you’re after a timber-look finish to match your existing fencing. Our gate frames are manufactured in heavy walled aluminium which can be powder coated in your desired colour. Once it’s manufactured, it can be used as a manual gate or you can add an electric motor in order to motorise it. Single-swing gates are a particularly economical choice when automating, as only one motor is actually required. #6 – They are easy to install – even you can do it! You’d be surprised at just how easy it is to master the art of installing fencing. All you really need is a tape measure, a small spade, string line, a crowbar, a spirit level, a reverse drill and some post-mix concrete! However, if you do find the prospect of DIY a little daunting, we’re also here to help. As one of Brisbane’s best fencing contractors, we’ll make sure your pedestrian gate is of the highest quality and aesthetic value. You’ve had your security fence installed, now it’s time to complete the look with a pedestrian gate! Contact the professionals at FenceCorp today on (07) 3715 5055.